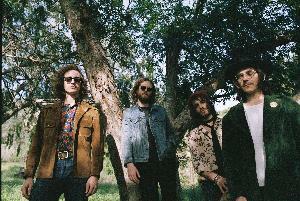 TRIPTIDES is a psychedelic rock group led by multi-instrumentalist Glenn Brigman. It began as a series of home recorded tape machine experiments but as the music has grown and transformed, so has the project. As a musician as well as a producer, Brigman has always surrounded himself with other like-minded musicians who have allowed him to perform his recording studio creations for audiences across the USA and Europe. From festival appearances at Desert Daze and Barcelona Psych fest to late night appearances on Last Call with Carson Daly, three European tours and a West Coast tour with the UK’s Temples, the group has continued at a strong pace and shows no signs of slowing down. Triptides has always meant something different to everyone; to the surfer it’s music to hit the beach to; to the psychedelic music enthusiast it’s an effort to create something groovy in the modern era without attempting to re-tread the same path; to some people it’s just a sound that makes them feel something. Whatever your style is, Triptides certainly aims to make you FEEL. Isn’t that what it’s all about?